When we recently reviewed the car navigation gadget Tom Tom Start 60, we realised just how easier car drivers have it over their cycling counterparts. If you commute on your bike, or you just love to burn some rubber to keep fit, you might have often found yourself getting lost, especially when pedaling to some place new. Whereas motorists can just switch on their satnav, cyclists have never enjoyed the same luxury... until now. We road test the Mio Cyclo 200. The Mio Cyclo 200 is a small, hand-held device, not much bigger than a phone. It clips to your handlebars and, by way of the anti-glare 3.5” touchscreen, displays information such as navigation, distance travelled, time, speed, and calories burnt to name but a few. Consider it a cross between a Tom Tom and an activity tracker. But as well as guiding you around all the roads in your locale (or anywhere in Europe, for that matter), it also contains information on cycle tracks and routes... you know, the stuff you actually need when getting around a place on a bike. We were surprised at how effective it's map knowledge was, and several new routes that had only recently opened up near our house were listed. Impressed. Using the Mio Cyclo 200 was a breeze, and anyone who has used a car satnav before will find the user interface quite familiar. Instructions were clear and accurate and we could always make out what was on screen, even in very bright sunshine. When we arrived at our destination, the Mio Cyclo 200 could be easily removed from the bike with a quick twist; negating the need to fiddle about with complicated straps and ties. If you're using your bike for just fun and fitness, you'll really like the Surprise Me mode the Mio Cyclo 200 offers. Simply enter in what kind of distance you're looking to cycle, or for how long, and the Cyclo 200 will present you with three alternate routes to take, always mixing a good blend of roads and cycle paths. Select the one that looks interesting and you're off. This was a great way to explore the city a bit more, as it took us down routes and into areas we'd never bothered cycling through. 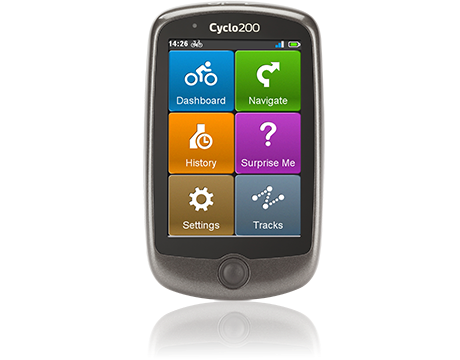 The Mio Cyclo 200 is also pre-installed with the whereabouts of points of interest specific to cyclists. Our routes through the city were highlighted with cafes, bike repair shops, and even hospitals and healthcare centres. This would be super handy if cruising through an unknown place and you suddenly needed a wee. Gotta think about these things. The on-board battery will last you for ten hours, and the unit itself is waterproof. You can't really ask for more than that – certainly that is a lot better than a Tom Tom!